What if you could bring the experience of visiting a science museum right to your school? Wouldn't that be great? Being able to save on not only admission costs, but transportation fees as well? Not having to deal with the hassles of permission slips or taking an entire day away from your curriculum requirements? Well, now you can. 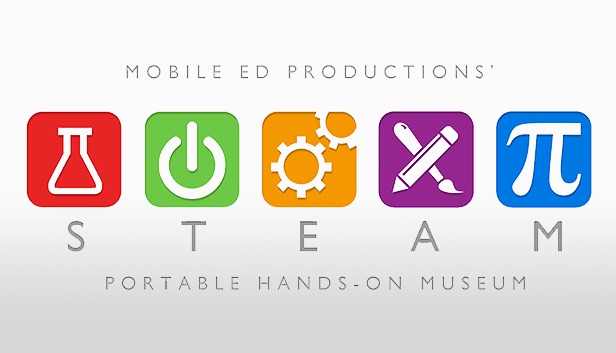 Say hello to Mobile Ed's STEAM Museum, ready to turn your gymnasium or multipurpose room into a state-of-the-art hands-on children's museum focused on STEAM education (science, technology, engineering, art and math). With activities suitable for all ages, you'll find workstations to not only augment your existing science and math curriculum, but you will also expose your students to high-tech fields of study they never before had access to. In addition, we put the A in STEAM by opening up your student's right-brains through activities that encourage divergent thinking. The STEAM Museum has something for all grade levels and interests. Students are encouraged to explore the museum at their own pace and manage their time between stations that appeal to their individual interests. Adult supervision from the Mobile Ed presenter and parent volunteers will be present at some of the stations to focus the students and to positively enhance the experience with small group instruction. STEAM Museum truly has something for everyone! From building an arch to programming a robot to 3D printing, we bring experiences your students might not ever have had before right to your doorstep – and plenty of them! With so much to do, you might need a second visit to see it all. We are committed to keeping STEAM Museum a cutting-edge experience. That's why every year we invest in new exhibits so you can bring the program back year after year and always see something fresh and exciting. The world's first educational pinball machine, STEAM Pinball is a state-of-the-art simulation that allows kids to explore gravity, friction, geometry, addition, subtraction, and positive and negative numbers through timeless pinball gameplay. Build a parabolic arch out of large kid-friendly foam blocks (with the help of a parent volunteer) and learn how this incredibly strong structure functions in the process. See how the ancient Roman's used this structure in their buildings, how American's used it in the St. Louis Gateway Arch, discover how force is dispersed, how a keystone works, and then knock it all down! A demonstration of a state-of-the-art 3D printer in action. Students watch as the printer creates a 3D model while it's visible on a computer monitor right before their eyes. Example models are on display of other practical (and just plain fun) objects that can be made with a 3D printer. A classic science museum exhibit! Students have to keep their hand steady as they attempt to pass a loop over a wire bent with increasingly difficult curves. If they touch the loop to the wire, they'll complete the circuit, it will beep, and they'll have to start over again. A fun way to learn about basic circuitry! All ages can create their own music, in three different styles, at this intuitive exhibit. You don't even know how to play an instrument or read music - anyone can do it! Students have to communicate and work together as well as recognize patterns in order to make their own hit songs. There are two different types of robots you can program at STEAM Museum. The first is a robot not unlike the NASA Discovery robot currently exploring the surface of Mars where students will learn step-by-step programming. The second is an advanced line-tracking robot that responds to color. Grab your markers and create paths, mazes and even game boards for this awesome robot. "Not only did Mr. A.J. present the STEAM principles in a fun and engaging manner, he also provided excellent character and career education for the students as well. The students hung on his every word along with their teachers. Many commented on how it was the best assembly they had ever seen. Thank you!" Seamlessly blending the disciplines of science, technology, engineering, art, and mathematics through cutting-edge, interactive exhibits...brought to you! Number of Sessions 1-6 sessions per day. Additional sessions (up to 8 total) available for an additional fee. An open area roughly 50' x 50' (2500 square feet). A gymnasium or cafeteria works best. Eight (8) 6'-8' banquet tables. Access to three (3) electrical outlets (1 20 amp circuit). A minimum of one (1) adult volunteer to help load-in/load-out and six (6), to help for the entire day to run various stations and activities. *A minimum of ten exhibits will be available on the day of the show. STEAM (science, technology, engineering, art, and math) education is a nationwide initiative that creates critical thinkers, increases science literacy, and enables the next generation of innovators. It is a synergestic approach to teaching the STEAM disciplines instead of isolating them as separate schools of thought. It is the next logical step in what the STEM initiative began by incorporating art to bring the right-brain into traditional scientific thinking. Augment your science program by exposing your students to dynamic examples of physics and material sciences - all with practical real-world examples. The Friction Raceway showcases gravity, inertia, and of course, friction, and the Plasma Sphere introduces the 4th State of Matter. We're on the cutting edge of today's fast-moving world bringing one of the most advanced humanoid robots ever built, programmable robots, 3D printing, and even an HD video presentation on robotics. Get your students ready for the jobs of tomorrow! See how they take to building a parabolic arch, creating a model roller coaster, or building a gear-driven mechanism. Get inspired by the incredible robotics on display and how everything works. Realize the connection between art and science through synergestic design and application. See how design choices turn complex machines into friendly companions, how engineers and designers are often one and the same, and how data can be beautiful. Everything ties into math, but the Pythagorean Theroem Wheel will get everybody to see the beauty in geometry and programming the various robots will showcase your logical thinking and problem solving abilities. Inspire your students to become the architects of tomorrow with Mobile Ed's STEAM Museum!